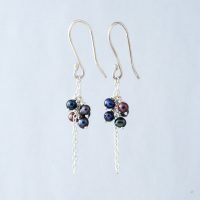 Beautiful earrings inspired by the Japanese spring time, which is marked by the flowering of the cherry blossom trees. Hanami, or flower viewing, is a Japanese spring tradition and a time of celebration, where the stunning beauty of the delicate flowers is enjoyed after the winter weather has subsided. The cherry blossom holds a deep significance in Japanese culture, representing the fragility and the beauty of life. Beautiful, handmade earrings inspired by the Japanese spring time, which is marked by the flowering of the cherry blossom trees. The name of the collection “Sakura” is the Japanese translation of cherry blossom. Each earring is formed from a delicate flower outline with a faceted citrine ball nestled in its centre. 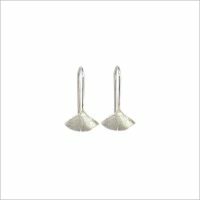 Size: Earrings are approx. 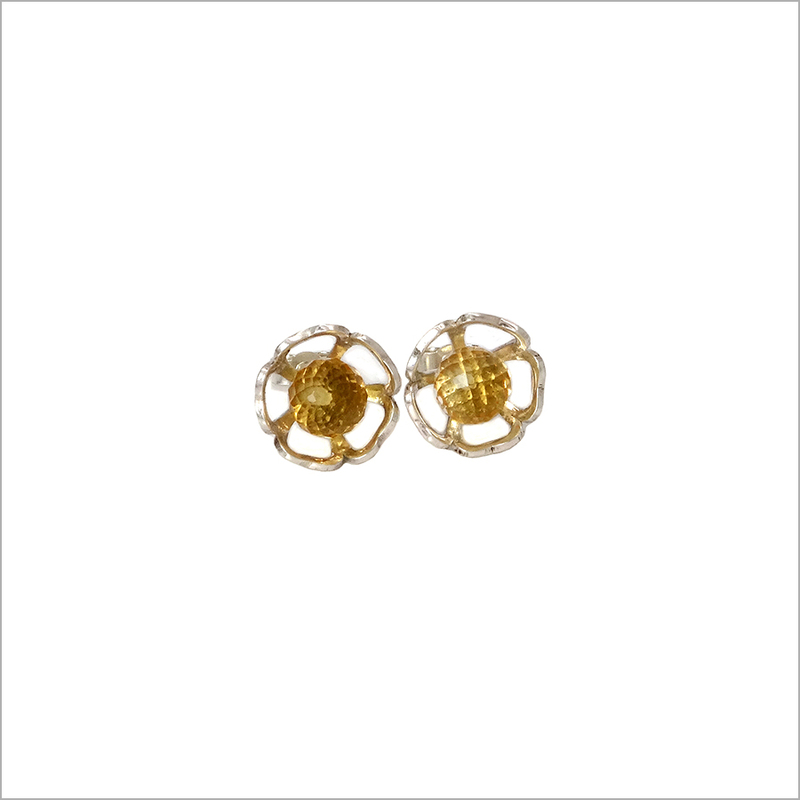 1.2cm in diameter with a 6mm round citrine ball. 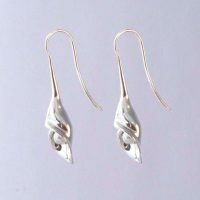 Earrings are hallmarked with traditional hallmarks and my very own makers mark registered with the London Assay Office. Please note that since all pieces are handmade to order, items can take 3 to 4 weeks to dispatch. If you need a piece sooner then please contact me and I will do my best to meet your requirements. Please also note that since all items are handmade, slight variations may occur in each piece and therefore items may differ slightly from the pictures shown. 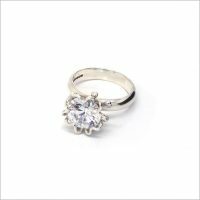 Each piece of jewellery bought from this web-site is specially hand-made when you order. 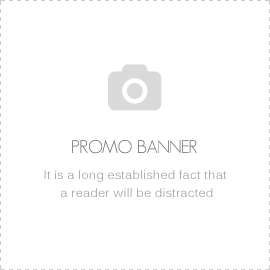 As a result of this, please allow 3 – 4 weeks from placing your order to your order being dispatched. If you need your order sooner then please contact Haru via the “Contact me” page and she will do her best to meet your requirements. UK customers: Items are sent by 'Royal Mail Special Delivery' as standard for a charge of £6.55. For other delivery options please contact me before placing your order via the "Contact me" page. Overseas customers: Shipping to overseas destinations will be charged at a flat rate of £12.90 and will be sent by 'Royal Mail International Signed'. If you require special delivery options please use the “Contact me” page to request details and prices for shipping to your country. 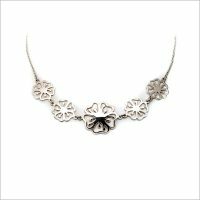 A beautiful necklace inspired by the Japanese spring time, which is marked by the flowering of the cherry blossom trees. Hanami, or flower viewing, is a Japanese spring tradition and a time of celebration, where the stunning beauty of the delicate flowers is enjoyed after the winter weather has subsided. The cherry blossom holds a deep significance in Japanese culture, representing the fragility and the beauty of life. 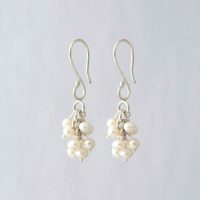 Sterling silver and white freshwater pearl earrings inspired by the simple beauty of Calla lilies. The word “Calla” is Greek for “magnificent beauty” and the flower is often considered to represent purity, both perfectly suited to its clean and elegant form. 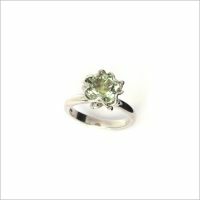 A beautiful cocktail ring inspired by the Japanese spring time, which is marked by the flowering of the cherry blossom trees. Hanami, or flower viewing, is a Japanese tradition and a time of celebration, where the stunning beauty of the delicate flowers is enjoyed after the winter weather has subsided. The cherry blossom holds a deep significance in Japanese culture, representing the fragility and the beauty of life. 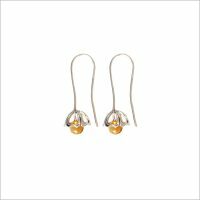 Earrings inspired by the clean and elegant form of the hozuki or Japanese lantern plant flowers. The hozuki flower enfolds a small and delicate fruit buried in its husk and so is considered by some to be a symbol for protection. 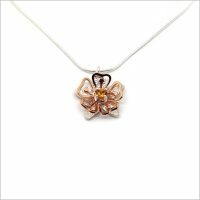 Available in sterling silver, 9ct gold plated or 9ct rose gold plated finishes. 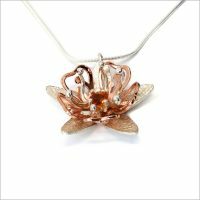 A beautiful large pendant inspired by the Japanese spring time, which is marked by the flowering of the cherry blossom trees. Hanami, or flower viewing, is a Japanese spring tradition and a time of celebration, where the stunning beauty of the delicate flowers is enjoyed after the winter weather has subsided. The cherry blossom holds a deep significance in Japanese culture, representing the fragility and the beauty of life. 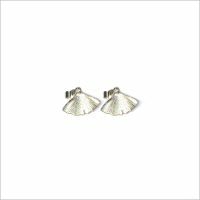 Sterling silver earrings inspired by the beauty and simplicity of the ginkgo leaf (“Ichōu”). Ginkgo trees are one of the oldest species of trees on earth have a great ability to withstand environmental stresses. Following the survival of several ginkgo trees after the Hiroshima bombing, they have become a strong symbol in Japan, representing longevity, resilience, peace and hope. Ginkgo is also well known for its health benefits and is considered to help brain function and improve memory. 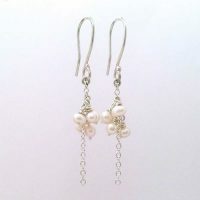 Sterling silver and white freshwater pearl earrings inspired by snowdrops. 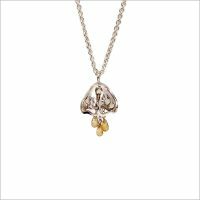 A beautiful long hanging drop pendant inspired by the Japanese spring time, which is marked by the flowering of the Sakura or cherry blossom trees. Hanami, or flower viewing, is a Japanese spring tradition and a time of celebration, where the stunning beauty of the delicate flowers is enjoyed after the winter weather has subsided. The cherry blossom holds a deep significance in Japanese culture, representing the fragility and the beauty of life. 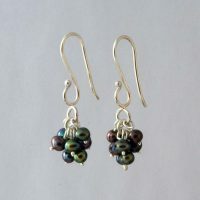 Sterling silver and peacock coloured freshwater pearl earrings inspired by snowdrops. 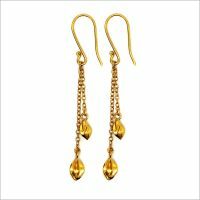 Available in sterling silver, 9ct yellow gold plated or 9ct rose gold plated finishes.